When you’re ready to establish a contract desk in the U.S., one of the most important decisions you will make is the best location for setting it up. A data-driven approach is important in this process. 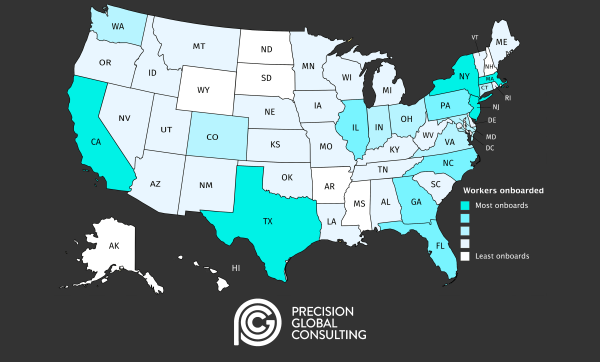 So, to give you an idea of which U.S. states onboard the most and least contract workers, PGC, a workforce management platform for the U.S. and Canada, have put together this heat map. This isn’t an overall reflection of the U.S. contingent workforce, but a high-level view of PGC’s workforce. 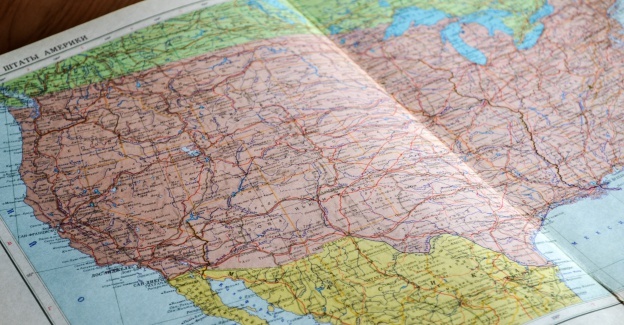 Each U.S. state varies from laws and taxes to talent pool and time zone, so you’ll need to do thorough research before making any business decisions. If you do this, then you’ll be in the best position to focus on a market that will support your business as it grows. Perhaps unsurprisingly, the states with the highest number of contingent workers are New York, California, Massachusetts, Texas and New Jersey. Meanwhile, the states with the lowest number of contingent workers are New Hampshire, Alaska, Wyoming, North Dakota, South Dakota, Arkansas and Mississippi. IT professionals make up 44 percent of our workforce. These workers are being placed into a variety of end-clients across different industries, which is in part due to agencies focusing on a niche technology or skillset. A good example of this is a company like Salesforce that services multiple industries. We can also see that California, Texas and the Northeast region have a high concentration of workers placed, but what the map doesn’t show is the growth potential of states such as Florida, Georgia, North Carolina, Illinois and Pennsylvania. Less workers have been hired in these states, but that doesn’t mean there aren’t workers to place. Our heat map shows onboards across the U.S., but Canada also holds potential opportunities, particularly around Toronto, Ontario. According to research done bywhich is in part due to agencies focusing on a niche technology or skillset. PGC, Toronto is the fourth most-populous area in terms of workers placed, with Ontario coming in fifth  at the state/province level. Are there good local universities to hire your internals as you grow? Does your chosen sector have growth prospects or is it in a state of decline? Does a potential location match with your chosen sector in terms of demand from clients and a supply of candidates? What is the level of competition in your area and how saturated is the market? The U.S. offers plenty of attractive prospects for a growing business but venturing into any new market can be equally daunting and rewarding for any business leader. The U.S. is particularly complex, with each state operating differently in culture and employment laws. Making the right decisions and getting expert advice early on will give your business the best chance of prospering and will help to avoid headaches, and even penalties down the road.